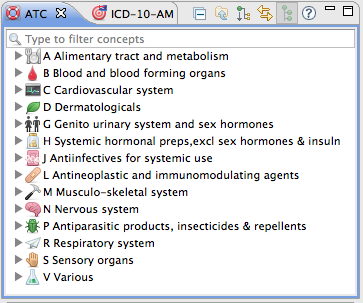 The codes of the Anatomical Therapeutic Chemical Classification System are organized in the ATC view. 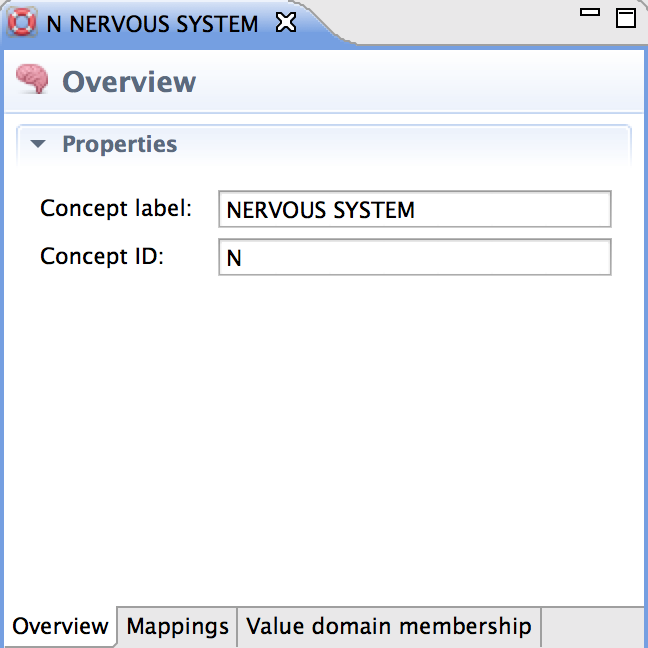 The view has the same browsing and filtering features as the SNOMED CT view described above, including integration with the Parents view. Dedicated icons represent the 14 main groups, e.g. a leaf represents Dermatologicals. Double clicking on an ATC code opens its ATC editor where the code ID and label can be reviewed. The editor can be used to make changes to the code, further information can be found in the Editing and Authoring section. You can see if the code is referenced in a value domain or in a mapping by going to the respective tabs where the details are listed. You can use the ATC search tab on the Search dialog to search for ATC concepts by their code and label. The search is not case sensitive. The ATC search also supports advanced query syntax discussed in the section on SNOMED CT. The results are displayed in the search view; they are sorted based on a similarity score. Click on the column headers to sort the results by code or label respectively. Double-click on a concept in the search view to open it in the concept editor. Show concept in ATC navigator: The selected concept will be revealed and highlighted in the ATC Concepts view. Add bookmark: Bookmarks concept. Bookmarked concept can be retrieved from the Bookmarks view. You can recognize bookmarked concepts by the small bookmark symbol that is added to the concept icon. Bookmark all results: Bookmarks all concepts that are displayed in the search view.